Project: The Paise, Hexham, Northumberland. Client: Mr & Mrs M Burnell. Above: external photographs of The Paise. 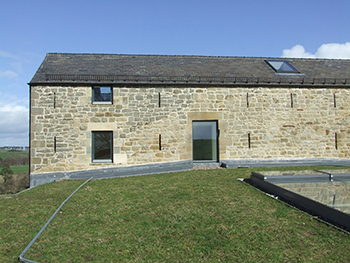 Recently nominated for Awards from both the Royal Institute of British Architects and the Royal Instituition of Chartered Surveyors, The Paise is a typical example of a 19th Century Northumberland farmhouse: featuring solid stone rubble walls, slate roofs, and small windows. It sits on a rise of land and faces almost directly south. From its elevated position the hills of Alston can be seen clearly. Local knowledge suggests that "… sticking a spade in the ground anywhere at The Paise will find water …". 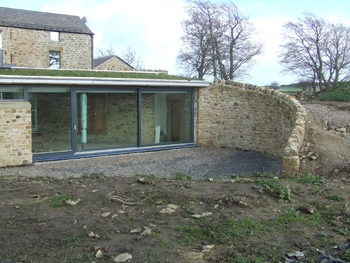 To produce their dream home our Clients engaged a local architect to design a scheme of refurbishment and new works. And, a Client Representative and Cost Consultant to liaise with the Architect. The Architect omitted to put in place an Appointment for the provision of architectural services. The project was reaching completion in the late summer of 2013 when a number of substantial ingresses of water occurred into and through the external walls, the roof, and the floor in a number of locations. We were approached by the Clients, and their Solicitors, and instructed to investigate and identify the causes of water entry to the building and to identify deficiencies of design, and of workmanship. We studied the Drawings prepared by the architect, and the Site records, and attended Site to examine the Works. From that it became apparent that not only was the building a partially underground structure, but that the waterproofing product specified and applied to the sub-surface construction was not approved by the Manufacturer for installation in any situation where it would be subject to hydrostatic pressure. In addition to which, the membrane had not been installed in accordance with the Manufacturer's instructions concerning lapping and sealing of joints. Nor had it been specified or installed in accordance with the applicable Agrément Certificate. Apparently those errors had not been noted during the regular Site Inspections. 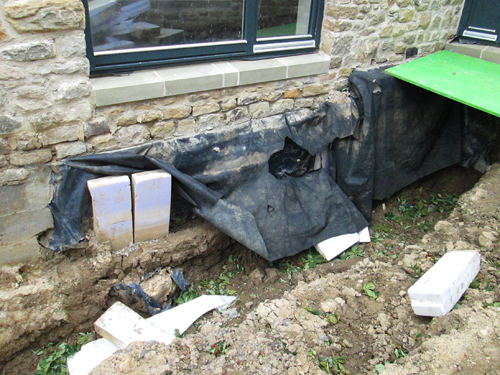 Above: incorrectly installed membrane and the resulting water ingress into the basement. Far right: lack of protection to "green" roof upstand and water run-off directed beneath the insulation. Extensive sections of the sub-surface Works were not designed or constructed in accordance with the applicable Codes of Practice, nor the relevant British Standards. Piecemeal remedial measures undertaken in an attempt to mitigate the likelihood of water ingress would have no long-term likelihood of success as the entire tanking installation was defective. That could only be resolved by replacement of the entire membrane beneath the floor of the building across the entire ground floor. Part of the building was covered by an inverted roof: such roofs were developed in Europe in the early 1960's where the form of design is, in consequence, well understood. Lately such construction has been re-titled "green" roofs, and the understanding of the critical aspects of their design has been ignored. To the "green" roof of this building, the selection and specification of materials, and their subsequent assembly by the Contractor was defective. Rainwater was directed to run off the roof both across the membrane, and beneath the insulation, so reducing the effectiveness of the thermal insulation dramatically. Upstands were incorrectly formed, and exposed the membrane to mechanical damage and to the damaging effects of ultra-violet light. The drainage system from the building was not connected to any system of underground rainwater disposal, and the form of the building sitting within a shallow scoop of land allowed the rainwater run-off from the building, and the landscape, to accumulate as in a giant saucer, with the building sitting centrally within the saucer. Not surprisingly, water was able to enter the building through the semi-basement walls and the floor, in substantial quantities. Above: water entry into the shell of the swimming pool and lead flashings with underside corrosion. 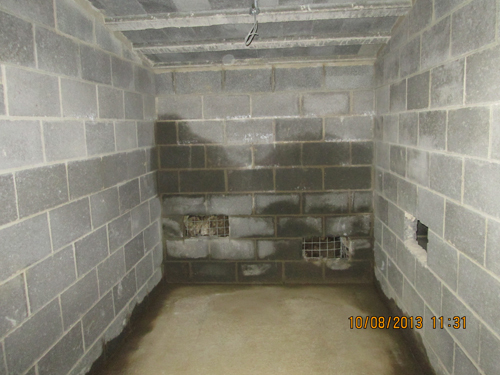 To the openings in the external walls there were inadequate upstands, and no integrated system of dampproof courses and cavity trays had been provided to prevent water entry. In such an exposed location the omission of such features is a critical error. 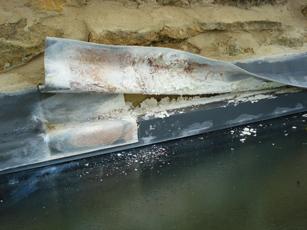 The underside of lead flashings was already seriously corroded, indicating excessive condensation and/or water leakage through the masonry structure, or both. No consideration appeared to have been given to the location of the building, nor to its extreme exposure to the prevailing southerly and south-westerly winds. 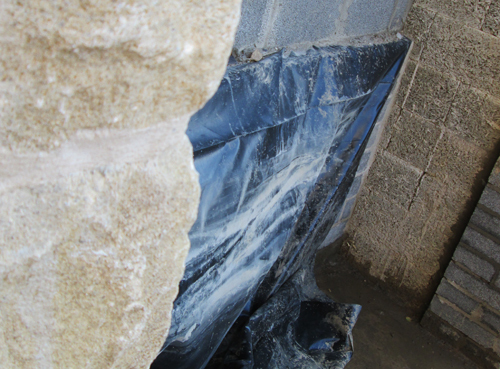 Rainwater driven into the masonry by the prevailing wind is able to descend to ground level, and emerge within the living areas as shown by dampness in the walls and efflorescence. 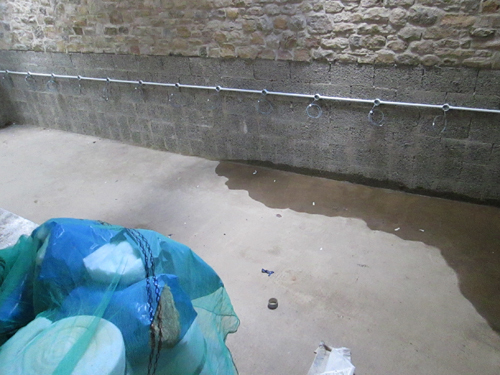 To the swimming pool, condensation risk analysis calculations demonstrated a severe risk of substantial interstitial condensation, with little regard paid in the design to the likely risk of condensation within the fabric. The most vapour resistant layer of the construction had been placed upon the external face of the assemblage of layers to the underground and above-ground sections of the building. 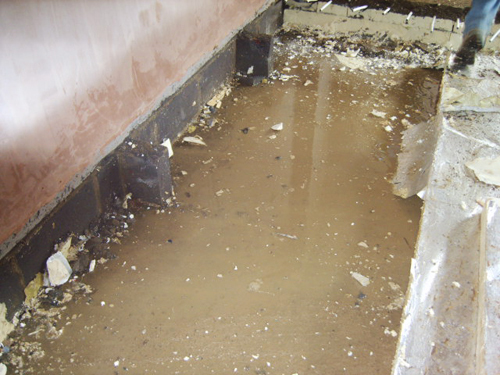 The floor screeds to the entire living area were incorrectly mixed and poorly laid, and of inadequate thickness. 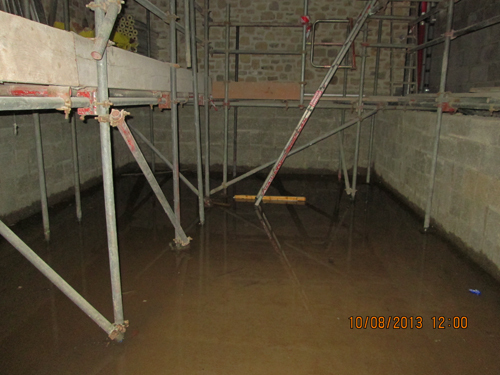 And, inundation of groundwater saturated the sub-screed insulation necessitating the removal of the defective screeds. Above: section demonstrating lack of an underground rainwater disposal system. We also inspected all of the internal doors installed by the Contractor: every example we noted to be defective in some way, with doors twisted out of shape, poorly fitting, or incorrectly hung. 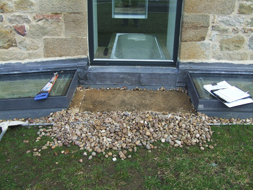 Other defects were noted to the fitting of the large sections of external glazing, where an absence of dpcs and cavity trays, together with an absence of rebates to openings, lead to water entering the building, evidenced by pattern staining to the floor finishes. The moral for Clients: south and west facing period farmhouses on elevated sites need careful design detailing. Basements and screeded floors are prone to problems, and "green" or inverted roofs must be designed and constructed with great care and an understanding of how they are intended to work if they are to achieve their intended thermal performance and durability. For architects: always ensure a comprehensive Appointment is put in place with the Client setting out the Conditions of the Appointment. The RIBA provide a range of suitable Contracts for use by Architects; there is extensive published work on cavity trays and dpcs around openings, including a British Standard; software is available to calculate condensation risk in buildings including swimming pools; and, there is guidance on the construction of inverted roofs, and basements. Always study and apply that as part of the design process and certainly before issuing a Certificate of Practical Completion for a leaking building! For Contractors: always install dampproof membranes and tanking products with great care, and always do so fully in accordance with the Manufacturer's instructions!